High definition videoconferencing doesn't have to cost a fortune. Despite the six-figure price tags of some high-end offerings, affordable HD videoconferencing is not an oxymoron. "In fact, a LifeSize Express HD videoconferencing system can be purchased today for under $6,000," says Todd Luttinger, CEO of the systems integrator/installer Videre Conferencing. "This is a fully-functional HD system." Is this a good deal? To answerthis question for your company, you need to know what HD videoconferencing truly is, how it works, and how it can be done cost-effectively. In its purest sense, HD videoconferencing is simply videoconferencing executed at HD resolution. To do this, every part of the transmission chain must be HD capable. The viewing monitors must be HD, providing widescreen (16:9) images at the 1080i (1920 x 1080 pixels) or 720p (1280 x 720 pixels) image standards. The videoconferencing cameras must also be HD capable, although some degree of video compression will likely be acceptable to reduce bandwidth demands. The video codecs must be capable of passing and receiving HD signals through whatever network is being used. That said, it isn't necessary to use full HD signal rates to achieve a reasonable HD-like experience. For instance, broadcast HDTV is typically 30 frames per second, but the HD videoconferencing standard for full motion video is 24 frames per second; equivalent to a motion picture frame rate. "Reduce the frame rate, and the bandwidth requirement drops from 1 Mbps to 768, 512 or even 384 kbps," Luttinger says. "Granted, the video may look a bit jerky, but the image quality will still be there." Worth noting: An HD videoconferencing system can communicate with a non-HD videoconferencing system, says Ira Weinstein, senior analyst and partner with Wainhouse Research, a market intelligence firm based in Duxbury, MA. "When the two systems connect, they automatically check each other's capabilities," he explains. "System One says, 'I can do HD; can you?' If System Two says, 'Yes', then they connect at an HD-compatible data rate. If System Two says, 'No', then System One connects at whatever non- HD data rate is acceptable to System Two." "The concept is what we call 'optimal definition,' " says Sean Lessman, Tandberg's senior director of advanced technology. Tandberg makes a range of cost-effective HD videoconferencing systems, starting at $8,000 for the Centric 1700 MXP. "Working together, the two systems select the frame rate, resolution, and data speed optimally suited for their interconnection." The bottom line: HD videoconferencing simply represents an upgrade to standard videoconferencing videoconferencing technology, not a radical or necessarily expensive change. The outstanding benefit of HD videoconferencing is picture quality. Just as with broadcast HDTV, high definition images provide a sense of reality that conventional television just can't match. For companies wanting to use videoconferencing on a regular basis, it is a good investment not just for today, but also for the future. Even in instances where an HD videoconferencing system is being used in SD, this technology delivers images that are typically cleaner and crisper than their analog equivalents. 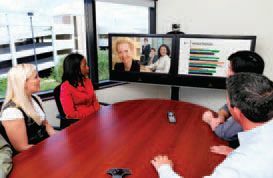 That's not all: HD videoconferencing systems like Polycom's HDX products "deliver significantly enhanced audio quality and the ability to deliver content in HD simultaneously," says Kevin Young, Polycom's senior manager of public relations. "The enhanced clarity and ability to do both video and content simultaneously in HD allows customers to use the technology for new types of applications that weren't previously possible." The KDV7819 from Kedacom is codec that costs around $9,999, yet delivers dual-HD video streams and full-range digital audio signals sampled at 48 kHz. Teliris is a company that emphasizes providing highly capable telepresence environments, rather than just point-to-point HD videoconferencing. As a result, its entry-level, single-screen Teliris Personal Telepresence product starts at $32,500. "Our system is the only one to offer 60 frames per second of video resolution, which provides a noticeable difference in the quality of the telepresence video," says Mack Treece, Teliris' president. "To enhance the telepresence experience, Teliris also offers interactive whiteboards and multi-touch tables, upon which local and remote users can literally 'pass' materials to each other to make modifications in real time." Telanetix also believes that HD videoconferencing needs to be more than a single-screen solution. This is why its $35,000 entry-level Executive Edition product comes with two 42- inch HD monitors, plus a "Digital Presence Kit" that includes the codecs, cameras, microphones, speakers, echo canceller, control panel, and all other equipment required. All of this comes built into a wheeled cart that can be moved from room to room. One way to create a more immersive experience on a budget is to mate an entry-level LifeSize system with an InFocus HD video projector. "Thanks to the quality of HD images, you can blow up HD video without losing the fine detail that this medium is so prized for," says David Woolf, InFocus' vice president of marketing. "What this also means is that you can use one video projector and screen to display two or more sources, rather than having to buy separate monitors. The result is a more compelling experience at an affordable price." Recently, Chinese manufacturer Kedacom has also entered the HD videoconferencing market with an endpoint codec device that retails for around $9,999. The KDV7810 has both an HDMI and HD-SDI interface, and, like the LifeSize systems, supports the ITU-T recommendation H.239 standard for full dynamic dual stream and static stream functions, as well as dual-channel 720p HD full dynamic video streams. With price tags under $35,000, HD videoconferencing technology is within the reach of many businesses and government agencies. Even so, it iscritically important to define your own particular needs before signing on the dotted line. For instance, is an entry-level single monitor solution sufficient for your needs? Granted, you will get higher image resolution, but the single monitor, fixed-focus camera and built-in microphone will force you either to only use one to two people on camera at a time, or gather around the unit as if your group is huddling close to a campfire. In the same vein, will a lower-cost solution create the kind of magic delivered by multiscreen telepresence solutions, where participants truly feel like they are all working in the same physical space? If not, then the system may not be worth it, warns Teliris' Treece. "The point of videoconferencing is to create a faceto- face experience across distance in order to reduce the need for people to spend money traveling to visit each other in person," he explains. "If your HD videoconferencing solution does not create this experience, then your travel costs will not go down." These are secondary considerations: The primary fact is that affordable HD videoconferencing is not an oxymoron. In truth, it is a reality that exists here and now, at prices that are truly inexpensive. James Careless is a freelance writer who specializes in communications-related stories. His writing credits include TV Technology, Television Broadcast, and Radio World magazines.